For other uses of "Rockaway", see Rockaway. Relatively isolated from Manhattan and other more urban parts of the city, Rockaway became a popular summer retreat in the 1830s. It has since become a mixture of lower, middle, and upper-class neighborhoods. In the 2010s, it became one of the city's most quickly gentrifying areas. The peninsula is part of Queens Community Board 14 and is entirely within New York's 5th congressional district, represented by Congressman Gregory Meeks. As of January 1, 2007, the peninsula's total population is estimated to be just below 130,000. Breezy Point, from Beach 149th to the western tip. All ZIP codes in Rockaway begin with the three digits 116 and the central post office is in Far Rockaway. In more modern history, Rockaway became a popular area for seaside hotels starting in the 1830s, and its popularity grew with the coming of the Long Island Rail Road's Rockaway Beach Branch to Long Island City and Flatbush Terminal (now Atlantic Terminal), which facilitated population growth on the Rockaway Peninsula when it opened in the 1880s. In 1878, the eastern community of Bayswater was laid out. One of Bayswater's early developers was William Trist Bailey, who had purchased the property. In 1893, much of Hog Island, a small sandbar island off the coast of Far Rockaway washed away in a hurricane. The remainder of the island eroded away by 1902. Plates, along with older artifacts, still wash up along the shore of Rockaway Beach. The Rockaway Peninsula was originally part of the Town of Hempstead, then a part of Queens County. In 1897, the central peninsular towns of Hammels (named after a local landowner, Louis Hammels) and Hollands merged, and were incorporated as the Village of Rockaway Beach. Rockaway split from the Town of Hempstead and along with the three western Queens townships of Jamaica, Flushing and Newtown plus Long Island City, formed the new borough of Queens, which was consolidated into Greater New York City in 1898  (the remainder of Hempstead Town, plus the two other eastern Queens townships of North Hempstead and Oyster Bay did not become part of the borough and ultimately split from Queens with the formation of neighboring Nassau County in 1899). The village of Rockaway Park became incorporated into the City of Greater New York on January 1, 1898. In the early 1900s, a new railroad station opened up the community and the rest of the peninsula to a broad range of the population. The wealthy no longer had a monopoly on the peninsula, and various amusement parks, stores, and resort hotels attracted people from all over the city to spend a day or a whole summer there. Much of the area was developed by James S. Remsen and William Wainwright. In this era, it became known as "New York's Playground". Around this time, Breezy Point in the Rockaways began as a neighborhood of summer beach bungalows; this kind of house became the most popular type of housing during the summer months. Even today, some of these remain, converted to provide modern amenities, although the vast majority were razed in urban renewal during the 1960s. In 1900, a New York State judge ordered that the land west of Rockaway Park be put up for auction. Belle Harbor and adjacent Neponsit were bought by Edward P. Hatch, who sold it to the West Rockaway Land Company in 1907. The president of the company, Frederick J. Lancaster, who had earlier developed the Rockaway neighborhood of Edgemere neighborhood, gave the new community its name. In 1905, before Lancaster acquired the land, a group of men wishing to form a yacht club entered into an grant agreement with the West Rockaway Land Company. The group, which had named itself the Belle Harbor Yacht Club, bought property from the company for $4,000. The agreement included 200 square feet of land and thirty plots of upland. That same year the group received corporation status by the State of New York and by 1908 began participating in its first inter-club ocean races with some of the city's other yacht clubs. The central-peninsula neighborhood of Hammels, along with the eastern communities of Arverne and Far Rockaway, tried to secede from the city several times. In 1915 and 1917, a bill approving the secession passed in the legislature but was vetoed by then-Mayor John Purroy Mitchel. Rockaway's famous amusement park, Rockaways' Playland, was built in 1901 and quickly became a major attraction for people around the region. With its growing popularity, concern over swimming etiquette became a problem and early in 1904, the Captain of the NYPD, Louis Kreuscher, issued rules for those using the beach, censoring the bathing suits to be worn, where photographs could be taken, and specifying that women in bathing suits were not allowed to leave the beachfront. The park was grand for its time. One of its most popular attractions, the Atom Smasher roller coaster, would be featured in the beginning of This is Cinerama, a pre-IMAX type movie, in 1952. An Olympic-size swimming pool and a million-dollar midway also were built within the amusement park; they would serve the community for more than 80 years. It was a popular place for New York families until 1985 when insurance costs and competition from major regional parks made it impossible to continue operations. Arverne became well known as a beachfront community with inexpensive summer bungalows, and hotels of varying levels of expense and luxury as well as amusements and boardwalk concessions, and it also attracted a year-round residential community. One grandiose plan for the community included a canal running through the neighborhood, reminiscent of the Amstel canal in Amsterdam, the Netherlands. The canal was never built; its right-of-way became Amstel Boulevard, which, except for a stub west of Beach 71st Street, was later incorporated into Beach Channel Drive. The first transatlantic flight departed from Neponsit on the Rockaway Peninsula. On May 8, 1919, four United States Navy Curtis-model seaplanes took off from what is now Beach Channel Drive to Newfoundland, Canada, the Azores Islands, and Lisbon, Portugal. Finally on May 31, 1919, one of the planes, piloted by Lt. Commander Albert C. Read, arrived in Plymouth, England. In the 1930s, Robert Moses came to power as New York City's Parks Commissioner and his extensive road and transportation projects were both a benefit and disaster for the neighborhood. As commissioner, Moses ordered the construction of the Marine Parkway Bridge and the Cross Bay Veterans Memorial Bridge. The bridges were completed in 1937 and 1939 respectively. The Marine Parkway Bridge was built further west on the peninsula between Jacob Riis Park and Breezy Point linking the isolated communities to Brooklyn. The Cross Bay Bridge landed in the middle of the neighborhood of Rockaway Beach. The construction of the two bridges started to transform the neighborhood and the rest of the peninsula into a more year-round residential area or commuter town, as people had a more convenient way to travel to and from work. The conversion of the Rockaway Beach LIRR branch to the Rockaway subway line also brought an increase to Rockaway's permanent residents. Although the bridges were intended to improve the Rockaways, Moses' other projects both directly and indirectly hurt the community. One such failed project was the planned construction of the Shore Front Parkway in the 1950s and 1960s. Wanting to connect Staten Island to the Hamptons, Moses focused on making a highway through the Rockaway Peninsula. His idea was to connect the Marine Parkway Bridge with the Atlantic Beach Bridge, which connected the Rockaway Peninsula to Nassau County. The plan would also provide an extension midway through to include the Cross Bay Bridge. Many feared that such an extensive project would do more harm to the peninsula than good and pointed to the community displacement that had happened in the South Bronx because of Moses' roadway construction Even though Moses never got to make his highway, he did leave his mark. A piece of the planned parkway that ran west to east in the Rockaway Park and Rockaway Beach neighborhoods was constructed and opened in 1939. Houses were literally cut in half in order to build the four-lane street. Some of these houses are still standing today. The existing, still unfinished street is locally known as the "road from nowhere to nowhere" because it does not have any relevant connections to any other area or highway. Robert Moses' construction of other recreational areas and facilities, such as the New York Aquarium and Jones Beach State Park, indirectly affected the neighborhood as well. These more modern recreational facilities lured tourists and beachgoers away from the peninsula. With fewer customers, businesses and hotels closed, and by the 1950s, the area had fallen into economic decline. The transition from a summer vacationing area to a full-time residential neighborhood had taken its toll. 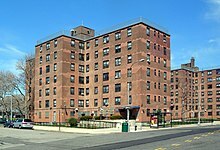 After World War II, several large public housing projects were built in the region as part of Moses' overall citywide neighborhood redevelopment plans, but these eventually became hotbeds of crime and related social pathologies. This provoked a backlash from some of the peninsula's more established residents (many of whom are of Irish Catholic heritage). A strong Jewish community (most of whose members are Ashkenazi Jews) also exists in and around Far Rockaway. For example, the city constructed the Hammel Houses in Rockaway Beach, one of the many urban renewal efforts that dominated the community and much of its eastern neighbors in the last half of the 20th century. The New York City Housing Authority purchased the land in 1952 on the north side of the elevated track. In 1964, the Authority decided to demolish and rebuild the entire area and turn it into a park. In 1960, Breezy Point was sold to the Atlantic Improvement State Corporation for $17 million; the residents of the 3,500-home community purchased half of the land for about $11 million and formed the Breezy Point Cooperative. The construction of apartment buildings commenced in the late 1960s and was halted by City ordinance. At the same time, much of the housing in the area was converted into year-round housing for low-income residents, and some of the bungalows were used as public housing. For nearly four decades, grand plans were offered for the 52-block stretch from Beach 32nd to 84th Streets, between Rockaway Beach Boulevard and the boardwalk. [There was to be] a phalanx of mid- and high-rise condominium and rental apartment buildings, [as well as] more than $1 billion... enclosed amusement area on the Arverne site, to be called Destination Technodome, with rides, movie theaters, an indoor ski slope and a hotel. Until 1975, an additional fare was charged to passengers departing the IND Rockaway Line (A and ​S trains of the New York City Subway) in any of the Rockaway-area stations, including Broad Channel, if the trip originated or terminated outside the area (in addition to the standard entry fare). In 1977, Rockaway was one of the few neighborhoods unaffected by the New York City blackout of 1977. In 1982, New York City granted Broad Channel residents the right to purchase their property. In 1998, Broad Channel's Labor Day parade included a float that parodied the racially motivated dragging death of an African American man, James Byrd, Jr.. Entitled "Black to the Future - Broad Channel in 2098", the float carried white men wearing blackface and Afro wigs, including two city firefighters and a city police officer who were fired from their jobs after their participation came to light. They sued the city for wrongful termination, and their claims were upheld in federal district court in 2003. Local residents expressed support for and relief at the ruling, hoping that an end to the court battle would help to rehabilitate the image of the town. The United States Court of Appeals for the Second Circuit reversed the ruling in 2006, holding that the firings could stand. After decades of grand redevelopment plans that fell through — for casinos, sports arenas, and other projects — planning began in 2002 for a large vacant section between Rockaway Beach and Arverne. By 2004, people were moving into the first completed buildings of the Arverne-By-the-Sea development. By 2012, the development included some 2,300 homes. That sparked nearby retail development, such as a Stop & Shop supermarket, Chase bank branch, local restaurants, and a Subway sandwich chain restaurant. Far Rockaway Shopping Center, in downtown Far Rockaway between the Far Rockaway subway station, and the Far Rockaway LIRR station, got its first new store in decades. Phase I of construction was completed in 2011; Phase II was begun in 2006. Arverne East, a development in nearby Edgemere west of Beach 59th Street is still under construction. As of 2003[update], this 97 acres (39 ha) "Edgemere Urban Renewal Area" will have 400 houses built within it. Of these, 47 acres (19 ha) are houses, 35 acres (14 ha) is a nature preserve, and 15 acres (6.1 ha) is a segment of preserved dunes on the beach. Elsewhere along the beach, zoning laws written decades ago for the hotel trade have allowed developers to build high-rises alongside the smaller old and new houses. In response, some communities have approved rezoning plans for their neighborhoods to stop "out of character" development. Opponents also contend that due to the rapidly growing population, the current infrastructure is inadequate and that there are environmental issues to consider. Those in favor of the development, however, contend that the development will help spur economic development and that the infrastructure cannot be upgraded until the population has reached a more noticeable level. Furthermore, some developers have questioned the legality of "down zoning". On August 14, 2008, however, a rezoning plan that limits the size of some buildings was approved by the New York City Council for five communities on the peninsula covering 280 blocks. The communities that were included are Rockaway Park, Rockaway Beach, Somerville, Edgemere, and Far Rockaway. With more and more people moving to the city, the Rockaways become a destination for adventurous day trippers. The area appears in New York Magazine's 2007 spring travel issue as a place for "male bonding" and to "scuba dive for sunken ships" via Sheepshead Bay's Jeanne II docks at Pier Five. Today the area still draws crowds during the summer with well-tended beaches. Jacob Riis Park and Fort Tilden are situated towards the western end of the peninsula, and are part of the Gateway National Recreational Area, which was created in 1972 as one of the first urban national parks. The 5.5 miles (8.9 km) long Rockaway Boardwalk and 170 acres (0.69 km2) of sandy beaches, fully accessible by the subway, make this a popular summer day trip for New York City residents. Toward the western end of the boardwalk, several portions of the beach are fenced off to preserve the nesting habitat for several species of terns and plovers, making for a unique urban birdwatching locale. After 2010, there was a major resurgence in the Rockaways' popularity. Various media began reporting on artists such as Andrew VanWyngarden, co-founder of popular psychedelic rock band MGMT, purchasing homes on the beach. The peninsula was dubbed "Williamsburg on the Rockaways", because some surfers from there began to spend whole summers out in the Rockaways. A number of businesses that cater to them, such as Rockaway Taco, have become popular among these down for the day tourists. There is even a summer shuttle bus which transports people from Williamsburg to the Rockaways. In February 2016, the Rockaways one of four neighborhoods featured in an article in The New York Times about "New York’s Next Hot Neighborhoods". On August 24, 1893, an intense storm, later classified as a hurricane, destroyed Hog Island, a mile-long island off the Rockaway coast that supported bath houses, restaurants and other leisure-time venues. On January 3, 1914, a violent storm devastated the peninsula, and swept the 1,200-seat Arverne Pier Theater away to sea. On June 15, 1922, much of Arverne was leveled by a fire that left about 10,000 people homeless, although the neighborhood was quick to rebuild. On June 6, 1993, a ship called the Golden Venture beached near Fort Tilden on the western half of the Rockaway Peninsula. The ship contained 296 Chinese illegal immigrants including 13 crew members. Ten people drowned trying to reach shore. Over 70 Rockaways residents were killed in the September 11 attacks on the World Trade Center in 2001, including people who worked there and New York City Fire Department firefighters and EMS personnel dispatched to the location. The city later opened Tribute Park on Jamaica Bay north of the Beach 116th Street shopping area in Rockaway Park, dedicating it to their memory. On clear days, the park affords an excellent view of the skyscrapers of Lower Manhattan, the former site of the WTC. In the center of the park is a piece of twisted steel from the ruins of the trade center's Twin Towers. Solemn ceremonies are held at the park every Sep 11, including a reading of the names of all of the locals who perished on that day. Almost exactly two months after 9/11, on November 12, 2001, American Airlines Flight 587 crashed in Belle Harbor, killing 265 people: 260 aboard the aircraft and five on the ground. Many of the passengers on the plane were from the Dominican community in Washington Heights. A temporary memorial was developed at the actual site of the disaster, on Newport Avenue. But after consultation with the families in the Belle Harbor and Washington Heights communities, a public memorial was erected at the south end of Beach 116th Street, a major shopping district and transportation hub in the area. Ceremonies commemorating the disaster are held at the memorial every November 12, including a reading of the names of all of those killed in the crash. In 2001, a resident told The Guardian: "It's impossible to understand unless you live here ... Father Michael Geraghty, a priest quoted in the same article, said that it was common for people to live in the houses that their parents lived in and that many families lived in the same houses for generations. The neighborhood suffered heavy losses from the September 11, 2001, terrorist attacks." The impact of the 9/11 attacks and Flight 587 on the community was the subject of the book Braving the Waves: Rockaway Rises, and Rises Again by Kevin Boyle. [note 1] The book contained many personal accounts of Rockaway residents and is interspersed with descriptions of other disasters in the Rockaways. On April 5, 2011, Georgetown University medical student Jason Maloney landed a single-engine airplane carrying two passengers on the beach at Beach 56th Street and Shore Front Parkway. After initially claiming he was required to make a forced landing due to a sick passenger, the pilot admitted he was inspired to perform a beach landing after watching the Discovery Channel show Flying Wild Alaska. The incident remains under investigation by the Federal Aviation Administration. On September 8, 2012, the peninsula was struck by a tornado that started as a waterspout over the Atlantic Ocean and came ashore at the Breezy Point Surf Club shortly before 11 a.m. In October 2012, Rockaway was devastated by Hurricane Sandy. Many homes in the Rockaways, especially in Breezy Point, were damaged or destroyed by high water, or by fires that raged beyond the capability of first responders to contain them. Residents lost everything in their basements, and hundreds of vehicles were ruined by the storm. One car caught fire when someone tried to start their vehicle, but residents put the fire out before official help arrived. On August 4, 2013, Senator Charles Schumer announced that the first phase of reconstruction on the beach, completed, would lay the groundwork for a second contract awarded later during the summer of 2013, totally paid for by the federal government through the Hurricane Sandy relief bill. During the storm, a fire, which spread between the closely spaced houses of Breezy Point while firefighters' access to the area was greatly hampered by flooding, destroyed 126 homes and damaged 22 more. Thousands of other houses were damaged by flooding. Fires also wreaked havoc along several blocks of Beach 130th Street in Belle Harbor, and among storefronts along Rockaway Beach Blvd. near Beach 114th Street in Rockaway Park. Large portions of the Rockaway boardwalk were swept away by the floodwaters, leaving only its supporting piers. The FDNY found 130 homes burned to the ground. Nearby, another 50 homes were damaged by the fire. According to an official report in December, rising seawater caused the fire by contacting a house's electrical wires. "Whalemina," a large, brightly colored statue of a smiling whale that had been a beloved iconic symbol of Rockaway since the 1990s, disappeared from Beach 94th Street near the Boardwalk and was presumed to have been swept out to sea. Based on data from the 2010 United States Census, the population of the Rockaways, including Broad Channel, was 114,961, a change of 8,261 (7.2%) from the 106,700 counted in 2000. Covering an area of 4,758.96 acres (1,925.88 ha), the neighborhood had a population density of 24.2 inhabitants per acre (15,500/sq mi; 6,000/km2). The racial makeup of the neighborhood was 35.2% (40,446) White, 38.9% (44,663) African American, 0.3% (309) Native American, 2.2% (2,555) Asian, 0.1% (63) Pacific Islander, 0.8% (877) from other races, and 1.7% (1,950) from two or more races. Hispanic or Latino of any race were 21% (24,098) of the population. The 100th Precinct has a lower crime rate than in the 1990s, with crimes across all categories having decreased by 74.5% between 1990 and 2018. The precinct saw 2 murders, 5 rapes, 38 robberies, 93 felony assaults, 59 burglaries, 161 grand larcenies, and 17 grand larcenies auto in 2018. The 101st Precinct also has a lower crime rate than in the 1990s, with crimes across all categories having decreased by 74.6% between 1990 and 2018. The precinct saw 6 murders, 26 rapes, 151 robberies, 301 felony assaults, 98 burglaries, 250 grand larcenies, and 31 grand larcenies auto in 2018. The only large hospital on the Rockaway Peninsula is St. John's Episcopal Hospital South Shore. Rockaway generally has a lower ratio of college-educated residents than the rest of the city. While 35% of residents age 25 and older have a college education or higher, 22% have less than a high school education and 43% are high school graduates or have some college education. By contrast, 39% of Queens residents and 43% of city residents have a college education or higher. :6 The percentage of Rockaway students excelling in math rose from 32% in 2000 to 58% in 2011, and reading achievement rose from 35% to 48% during the same time period. St. Virgilius School, a Roman Catholic School that was part of the Diocese of Brooklyn, closed in 2006, as part of Bishop Nicholas DiMarzio's effort to close, en masse, Catholic schools with low enrollment. The Far Rockaway branch at 1003 Beach 20th Street (temporary location). The old library at Central Avenue is being replaced with a new structure, and construction started in November 2018. A fifth Queens Library branch, the Broad Channel branch, is located at 16-26 Cross Bay Boulevard in Broad Channel. Rockaway is served by multiple transportation services. The New York City Subway's IND Rockaway Line (A train), which has a terminal at Mott Avenue, passes through the eastern Rockaways. The A and ​S trains, which ends at Rockaway Park – Beach 116th Street, serve the central Rockaways. The latter was the terminal of the former Rockaway Beach Branch of the Long Island Rail Road (LIRR). The Far Rockaway terminal station for the LIRR's Far Rockaway Branch is located in Far Rockaway. 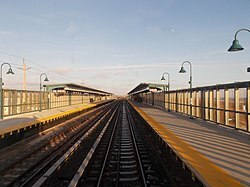 The branch had originally been part of a loop that traveled along the existing route, continuing through the Rockaway Peninsula and heading on a trestle across Jamaica Bay through Queens where it reconnected with other branches. Frequent fires and maintenance problems led the LIRR to abandon the Queens portion of the route, which was acquired by the city to become the IND Rockaway Line. MTA Regional Bus Operations routes include Q22, Q35, Q52/Q53 SBS, Q113, Q114, QM15, QM16, QM17 and QM18, and Nassau Inter-County Express (NICE) routes include N31, N32 and N33 in Far Rockaway only. Unlike other NICE routes in Queens, these buses operate open-door in Far Rockaway, meaning customers can ride these buses wholly within the neighborhood without necessarily going to Nassau County. NYC Beach Bus, a privately operated shuttle bus between downtown Brooklyn or Williamsburg and the area around Beach 84th Street and Jacob Riis Park, also runs in the area. One can also take a converted former school bus named Rockabus from Williamsburg, Brooklyn. Ferry operator SeaStreak began running a city-subsidized ferry service between a makeshift ferry slip at Beach 108th Street and Beach Channel Drive in Rockaway Park and Pier 11/Wall Street in Manhattan's Financial District, then continuing on to the East 34th Street Ferry Landing, after Hurricane Sandy in October 2012 destroyed much of the IND Rockaway Line. In August 2013, a stop was added at Brooklyn Army Terminal. Originally intended as just a stopgap alternative transportation measure until subway service was restored to the Rockaways, the ferry proved to be popular with both commuters and tourists and was extended several times, as city officials evaluated the ridership numbers to determine whether to establish the service on a permanent basis. The fare was raised to $3.50 per ride during the extension period from $2 previously. Between its inception and December 2013, the service had carried close to 200,000 riders, city officials said. When the city government announced its budget in late June 2014 for the upcoming fiscal year beginning July 1, the ferry only received a $2 million further appropriation, enough to temporarily extend it again through October, but did not receive the approximately $8 million appropriation needed to keep the service running for the full fiscal year. Local officials and community activists expressed dismay with the decision, saying it was a blow to the Rockaways as the area continues to struggle economically in the aftermath of the 2012 hurricane. A spokesperson for the city government's Economic Development Corporation said that “We will continue to examine ridership and seek a sustainable funding stream that can support the $25-$30 subsidy per trip — the highest by far of any public transportation in the city.”  Efforts by local elected officials and community activists to convince the city government to reverse its decision and continue funding the ferry were unsuccessful, and it made its last trip on the night of October 31, 2014. On May 1, 2017, NYC Ferry's Rockaway route started operations between Pier 11/Wall Street in Manhattan's Financial District and Beach 108th Street in Rockaway Park, with a stop at Brooklyn Army Terminal. The Rockaway Arts Council provides a wide range of events throughout the year. Two art groups in Rockaway, the Rockaway Theater Company and the Rockaway Artists' Alliance, hold most of their productions in Fort Tilden. Boardwalk Empire, a popular HBO series (2010-2014), was partially filmed at Fort Tilden and the Boardwalk, standing in for Atlantic City in the 1920s. Jill Eisenstadt's classic novel From Rockaway is set within the world of Rockaway's lifeguard culture during the 1980s. Her 2017 novel, Swell, brings back some of the same characters over one eventful weekend in June 2002. In the early 1980s, Christine Lavin, a New York-based folk singer, wrote the poignant song "Rockaway" about her family home. Woody Allen's Radio Days, a 1987 movie about a working-class family during the Golden Age of Radio, was filmed on location in Rockaway Park, with period facades and cars. Patricia Reilly Giff's 1998 Newbery Award-winning novel Lily's Crossing is set in the Rockaways. The story, about a girl's friendship with a Hungarian refugee, was inspired by the author's own childhood memories of Rockaway Beach during World War II. A companion book, Willow Run, features Rockaway as the home of Margaret Dillon, a child whose family moves in 1944 to Willow Run, Michigan (now between Ypsilanti, Michigan and Belleville, Michigan) to work at Henry Ford's Willow Run B-24 Liberator bomber plant as part of the United States civilian war effort. Naomi Ragen's 2002 semi-autobiographical novel Chains Around the Grass is set in a public housing project in Rockaway, reflecting Ragen's own upbringing there. The 2010 documentary film Our Hawaii, by Kryssa Schemmerling, explores the surf culture that sprung up at Rockaway starting in the late 1960s. The Rockaways' distance from the heart of the city and seeming status as a sleepy, isolated, career-killing backwater far from the big-city hustle and bustle and professional challenge of police work in fast-track Manhattan was noted in a Season 8 episode of NYPD Blue ("Thumb Enchanted Evening"); dismayed by the news that detective squad leader Arthur Fancy has been promoted to captain and will soon leave the 15th Squad, Andy Sipowicz warns him that "when you're out in Far Rockaway, working some serial purse-snatcher, don't say nobody warned you." The Ramones' song "Rockaway Beach", on their 1977 album Rocket to Russia, became the American punk rock group's highest-charting single, peaking at number 66 on the Billboard Hot 100. Written in the surf rock style of the Beach Boys and other similar bands, the song was composed by the group's bassist, Dee Dee Ramone, who liked to spend time on the beach there. In 2013, the 36-year-old song was dusted off and revived in a radio ad campaign aimed at promoting Rockaway's beaches as part of the peninsula's post-Hurricane Sandy recovery effort. Skip Campbell (1948-2018), Florida legislator and mayor of Coral Springs, Florida born in Rockaway Beach . Patti Smith (born 1946), punk rocker-poet, wrote about living in Rockaway Beach in her 2015 memoir, M Train. Andrew VanWyngarden (born 1983), co-founder of psychedelic rock band MGMT, bought a house in Rockaway Beach in 2012. Kenny Vance (born 1943), singer-songwriter and producer. ^ Boyle was also the publisher of the peninsula's newest newspaper, The Rockaway Times. Boyle was the former editor of The Wave, one of Rockaway's local newspapers and the oldest weekly newspaper in New York City. ^ "Queens Community Boards". Retrieved September 18, 2014. ^ Briano, Nicholas (March 21, 2008). "Rockaway Population Popping At Record Pace". The Wave. Archived from the original on June 15, 2011. Retrieved October 18, 2008. ^ Lucev, Emil (2007). The Rockaways. Charleston, South Carolina: Arcadia Publishing. ISBN 978-0-7385-4990-3. ^ Governor Kieft's Personal War, Retrieved November 28, 2006. ^ a b "Rockaway..."place of waters bright"". The Wave. Archived from the original on November 27, 2006. Retrieved October 19, 2008. ^ a b Jackson, Kenneth T., ed. (1995), The Encyclopedia of New York City, New Haven: Yale University Press, ISBN 0300055366 , p. 120. ^ The Rockaways. Accessed October 2, 2007. "The Bayswater section was laid out about 1878 by William Trist Bailey, who purchased the property from J.B. and W. W. Cornell. The first Rockaway hunt with hounds started from this spot and the first yacht club was erected there." ^ The Big One Archived October 19, 2008, at the Wayback Machine, New York Press, Retrieved October 18, 2008. "In the years after the Civil War, developers built saloons and bathhouses, and Hog Island became a sort of 1890s version of the Hamptons. During the summers, the city's Democratic bosses used Hog Island as a kind of outdoor annex of Tammany Hall." ^ The Big One Archived October 19, 2008, at the Wayback Machine, New York Press, Retrieved October 18, 2008. "In the dredged-up sand, Coch's students found hundreds of artifacts—plates, whiskey bottles, teapots, beer mugs, lumps of coal and, what proved to be the most telling clue of all, an old hurricane lamp." ^ Onishi, Norimitsu (March 18, 1997). "Queens Spit Tried to Be a Resort but Sank in a Hurricane". New York Times. Retrieved February 25, 2010. ^ "Before the Five-Borough City: Queens". This map shows the boundaries of the former towns and the former city within the present Borough of Queens. 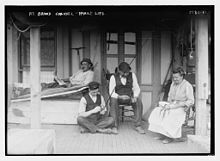 ^ Herszenhorn, David M. "THE CENSUS -- A Region of Enclaves: Breezy Point, Queens; Bounded by Gates, Over a Toll Bridge", The New York Times, June 18, 2001. Accessed November 1, 2007. "The neighborhood, started in the early 1900s as a summer bungalow community and called the Irish Riviera..."
^ Seyfried, Vincent; Asadorian, William (1999). Old Rockaway, New York, in Early Photographs. Mineola, NY: Dover Publications. p. 93. ISBN 0-486-40668-7. Retrieved January 27, 2012. ^ "A Summer Girl Edit". New York Times. May 16, 1904. p. 9. ^ "Theme Parks". About.com. Archived from the original on March 19, 2006. Retrieved December 7, 2006. ^ "Rockaway...'place of waters bright'". The Wave. Archived from the original on November 27, 2006. Retrieved December 6, 2006. ^ "Neponsit Malls". New York City Department of Parks & Recreation. Retrieved August 7, 2010. ^ "Cross Bay Veterans Memorial Bridge, Historical Overview". Retrieved September 18, 2014. 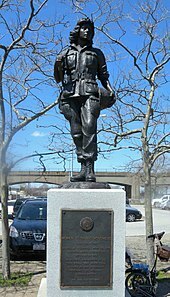 ^ "Marine Parkway-Gil Hodges Memorial Bridge, Historical Overview". Retrieved September 18, 2014. ^ "An Oceanfront Parkway for the Rockaways". NYCroads.com. Archived from the original on November 13, 2006. Retrieved December 6, 2006. ^ "Shore Front Parkway and Its Results". The Wave. Archived from the original on September 28, 2007. ^ a b "Hammel Playground". Retrieved September 18, 2014. ^ Steven Hevesi (7 December 2003). "In Rockaways, a Tide Is Coming In". The New York Times. Retrieved 2 February 2015. ^ "The New York Racist Float Case: How the First Amendment Does - and Does Not - Protect Racist Cops and Firemen", FindLaw, July 16, 2003. ^ Kilgannon, Corey (June 26, 2003). "Ruling in '98 Blackface Case Finds Favor in the Community". New York Times. Retrieved August 29, 2010. ^ Cardwell, Diane (April 28, 2006). "Court Upholds City Firings Over Racial Insult at Parade". New York Times. Retrieved August 29, 2010. ^ Kilgannon, Corey (2012-11-19). "A Much Criticized Pocket of the Rockaways, Built to Survive a Storm". City Room. Retrieved 2019-02-19. ^ "Arverne by the Sea Website". Retrieved September 18, 2014. ^ "4Rockaway Beach becomes 'Hipster Hamptons". Newsday. August 13, 2012. Retrieved October 15, 2012. ^ "4Top 10 neighborhoods for real estate investment". New York Daily News. August 10, 2012. Retrieved October 15, 2012. ^ "Bloomberg's Big Day In Rockaway" (PDF). The Wave. November 10, 2006. Retrieved May 11, 2012. ^ Rosenberg, Miriam (February 2, 2007). "Rockaway Park Votes 'Go' On Rezoning". The Wave. Archived from the original on June 15, 2011. Retrieved April 7, 2007. ^ Colangelo, Lisa (June 6, 2012). "Renewed hope for barren Far Rockaway Shopping Center". New York Daily News. Retrieved October 16, 2012. ^ Magoolahan, Brian (March 23, 2007). "Pop! Number of New Residents Surges". The Wave. Archived from the original on September 28, 2007. Retrieved April 7, 2007. ^ Rosenberg, Miriam (July 14, 2006). "RB Downzone Debate Rages On". The Wave. Archived from the original on September 28, 2007. Retrieved April 7, 2007. ^ "Rockaway Neighborhoods Rezoning". Archived from the original on October 20, 2014. Retrieved September 18, 2014. ^ "Rockaways Hipsterfication Report: MGMT Buys A House, Beer Garden Looms". Gothamist. Archived from the original on February 27, 2015. Retrieved September 18, 2014. ^ Michael Idov. "Williamsburg in the Rockaways". New York Magazine. Retrieved Oct 17, 2012. ^ "Rockaway Beach is the Hipster Hamptons". am New York. Archived from the original on August 18, 2012. Retrieved September 18, 2014. ^ NORIMITSU ONISHI (March 18, 1997). "Queens Spit Tried to Be a Resort but Sank in a Hurricane". The New York Times. Retrieved November 3, 2014. ^ "400 Buildings Burned at Arverne; 10,000 Made Homeless; 60 Injured, Loss $4,000,000 in Half Square Mile". The New York Times. June 16, 1922. Retrieved August 21, 2009. ^ Stout, David (November 18, 1995). "Suspected Organizer of Golden Venture Operation Is Arrested". The New York Times. Retrieved March 11, 2008. ^ Younge, Gary. "Flight to the death: Just two months after 9/11, a Queens suburb suffered the second-worst plane crash in US history. Five years on, residents tell Gary Younge, the cause remains worryingly unresolved", The Guardian, November 11, 2006; accessed January 24, 2008. "On flight 587, myriad immigrant stories of hope foundered. On board was Hilda Yolanda Mayol, 26, a waitress who had escaped from the north tower of the World Trade Center and was heading to the Dominican Republic with her mother and children to take her mind off the trauma." ^ Wilson, Michael (April 5, 2011). "Pilot With Sick Passenger Lands on Rockaway Beach". The New York Times. ^ Tomassini, Jason (April 6, 2011). "Morning Buzz – Beach Landing Raises Questions". The New York Times. ^ "NYC Neighborhood Startled By Unexpected Tornado". Huffington Post. September 8, 2012. ^ Shapiro, Lila; Knafo, Saki; Hallman, Ben (October 30, 2012). "Rockaways Face Widespread Destruction: It Was Like Sitting 'In The Middle Of The Sea'". Huffington Post. Retrieved November 3, 2012. ^ Conlin, Michelle (October 30, 2012). "Huge fire in Sandy's wake destroys New York City beach community". Chicago Tribune. Retrieved November 3, 2012. ^ a b Neumeister, Larry (October 30, 2012). "At least 80 flooded houses destroyed by NYC fire". USA Today. Associated Press. Retrieved November 24, 2015. ^ "Project adds 600,000 cubic yards of sand to help Rockaway Beach". MyFoxNy. Archived from the original on August 9, 2013. Retrieved August 4, 2013. ^ Nessen, Stephen. "The First Neighbors Return to Devastated Breezy Point". WNYC.org. Archived from the original on November 3, 2012. Retrieved November 3, 2012. ^ "Superstorm Sandy's toll: Mounting deaths, historic destruction, stranded residents". CNN. October 30, 2012. ^ Sandy (October 30, 2012). "Update: Breezy Point, Queens blaze upgraded to 6-alarm fire, at least 50 homes completely destroyed by fire - @FDNY". breakingnews.com. Retrieved June 11, 2014. ^ Leitsinger, Miranda (November 5, 2012). "Parting with life's props: A tough cleanup begins in Breezy Point - U.S. News". Usnews.nbcnews.com. Retrieved June 11, 2014. ^ "Update: Breezy Point, Queens blaze upgraded to 6-alarm fire, at least 50 homes completely destroyed by fire - @FDNY - breakingnews.com". breakingnews.com. Retrieved September 18, 2014. ^ "Cause of Breezy Point Fire During Sandy Determined: City Fire Marshals say that rising sea water came in contact with electrical wires". NBC New York. Retrieved September 18, 2014. ^ a b c d e f g h i j k l m n o "Rockaway and Broad Channel (Including Arverne, Bayswater, Belle Harbor, Breezy Point, Broad Channel, Edgemere and Rockaway)" (PDF). nyc.gov. NYC Health. 2018. Retrieved March 2, 2019. ^ "NYC-Queens Community District 14--Far Rockaway, Breezy Point & Broad Channel PUMA, NY". Census Reporter. Retrieved July 17, 2018. ^ "NYPD – 100th Precinct". www.nyc.gov. New York City Police Department. Retrieved October 3, 2016. ^ "100th Precinct CompStat Report" (PDF). www.nyc.gov. New York City Police Department. Retrieved July 22, 2018. ^ "Engine Company 329". FDNYtrucks.com. Retrieved March 7, 2019. ^ "Engine Company 268/Ladder Company 137". FDNYtrucks.com. Retrieved March 7, 2019. ^ "Engine Company 266". FDNYtrucks.com. Retrieved March 7, 2019. ^ "Engine Company 265/Ladder Company 121". FDNYtrucks.com. Retrieved March 7, 2019. ^ "Location Details: Arverne". USPS.com. Retrieved March 7, 2019. ^ "Location Details: Rockaway". USPS.com. Retrieved March 7, 2019. ^ "Location Details: Rockaway Beach". USPS.com. Retrieved March 7, 2019. ^ "Rockaway/Broad Channel – QN 14" (PDF). Furman Center for Real Estate and Urban Policy. 2011. Retrieved October 5, 2016. ^ "Church Of God Christian Academy". Retrieved September 18, 2014. ^ "Branch Detailed Info: Arverne". Queens Library. Retrieved March 7, 2019. ^ "Branch Detailed Info: Seaside". Queens Library. Retrieved March 7, 2019. ^ "Branch Detailed Info: Broad Channel". Queens Library. Retrieved March 7, 2019. ^ Rock Rock Rockaway Food Stands. October 18, 2012. ^ "Rockaway Ferry Floats On Through May, But Trip Will Cost Nearly Double - Rockaway Beach - DNAinfo.com New York". Dnainfo.com. January 20, 2014. Archived from the original on March 30, 2014. Retrieved April 20, 2014. ^ "Jill Eisenstadt revisits Rockaway Beach, 30 years later". Newsday. May 26, 2017. Retrieved December 8, 2018. ^ Italie, Hillel (June 5, 2017). "Homecoming: Jill Eisenstadt ends long hiatus as novelist". AP NEWS. Retrieved December 8, 2018. ^ Harris, Elizabeth A. "A Radio Days House Survives the Hurricane", The New York Times, November 26, 2012. Accessed August 22, 2017. "That house, said Lee Quinby, a co-owner, played the role of the family home in the Woody Allen movie Radio Days, a 1987 tribute to the glory days of radio and the delights of familial bickering, as well as a love song to the Rockaways of around the early 1940s." ^ "Chains Around the Grass, Publishers Weekly. Accessed August 22, 2017. "Based on novelist Ragen's own experiences growing up in an ethnically mixed low-income housing project in the Rockaways, this novel opens a window into the bittersweet world of the Markowitz family as they struggle to make ends meet in 1950s New York City." ^ "KRYSSA SCHEMMERLING/OUR HAWAII", New York Foundation for the Arts. Accessed August 22, 2017. "A group of locals overcome myriad obstacles to surf amid the urban decay of Rockaway Beach, Queens." ^ "From 'Forest Hills: Birthplace of Punk' to 'Rock Rock Rockaway Beach'", Queens Museum. Accessed August 22, 2017. "'Rockaway Beach', written by Dee Dee Ramone and released on the Ramones’ 1977 album Rocket to Russia, has become the anthem of the largest urban beach in the United States, treasured by surfers, day trippers, and residents alike." ^ "Surf, Surf, Surf Away at Rockaway Beach", New York City Department of Parks and Recreation press release dated July 27, 2007. Accessed August 22, 2017. "The Ramones immortalized the beach’s allure in their 1977 hit 'Rockaway Beach' and since then, surfers have come from far and wide to catch Rockaway’s waves." ^ Warren, James. "Radio ad campaign to use Ramones hit 'Rockaway Beach' to lure visitors back to the shorefront devastated by Hurricane Sandy ", New York Daily News, June 3, 2013. Accessed August 22, 2017. "The Queens Economic Development Corporation is launching a radio ad campaign featuring the legendary punk rock band's hit "Rockaway Beach" to lure people back to a shorefront devastated by Hurricane Sandy." ^ Kovaleski, Serge F. "A Baseball Lover, Key to Tarnishing a Yankee Era", The New York Times, December 15, 2007. Accessed February 19, 2008. "Mr. McNamee was raised in the Breezy Point section of Queens, on the westward end of the Rockaway Peninsula, an area with many police officers, like his father." ^ Morales, Tina (February 25, 1990). "SCHOOL OF THE WEEK/Far Rockaway High School". Newsday. ProQuest Archiver. Retrieved November 25, 2015. (Subscription required (help)). ^ Green, Penelope. "Patti Smith, Survivor; In her new memoir, M Train, the punk elder makes peace with her ghosts and finds solace in a century-old bungalow in the Rockaways. ", The New York Times, October 3, 2015. Accessed September 13, 2018. "Patti Smith, the musician and author, in the yard of her home in Rockaway Beach, Queens." ^ Rockaways Hipsterfication Report: MGMT Buys A House, Beer Garden Looms Archived February 27, 2015, at the Wayback Machine, Gothamist. Retrieved October 16, 2012. ^ Rearick, Kristie. "Kenny Vance and the Planotones keep fans happy with stop in Pitman", South Jersey Times, May 17, 2013. Accessed September 13, 2018. "A resident of Rockaway Beach in Queens for 38 years, a visit from Hurricane Sandy last October completely destroyed his home." Wikimedia Commons has media related to Rockaway, Queens.